Order Ritchies Red Grape Juice Concentrate 250ml from the Stirling Homebrew Shop UK. 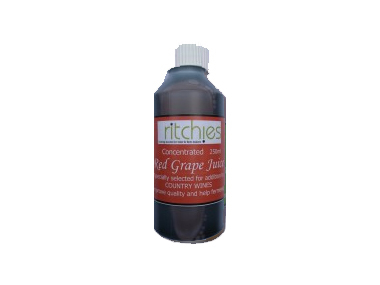 Buy Ritchies Red Grape Juice Concentrate - 250ml and other Homebrew Chemicals safely online in the UK. Use grape juice concentrate to add to country wines to improve quality and help fermentation. Use grape juice concentrate to add to country wines to improve quality and help fermentation. Where to buy Ritchies Red Grape Juice Concentrate 250ml safely online? Shop at the Stirling Homebrew Shop if you are wondering where you can buy Ritchies Red Grape Juice Concentrate - 250ml safely online in the United Kingdom. Red Grape Juice Concentrate 250ml - Ritchies Red Grape Juice Concentrate - 250ml in Homebrew Chemicals and Homebrew.